When the jewel collection of the late Princess Margaret of the United Kingdom went up for auction at Christie's ten years ago, many of the pieces for sale had been received as gifts from others. Today's ring, though, was one that Margaret designed herself. The auction's lot notes describe the ring as follows: "three oval rubies between baguette-cut diamond shoulders and brilliant-cut diamond edge detail." 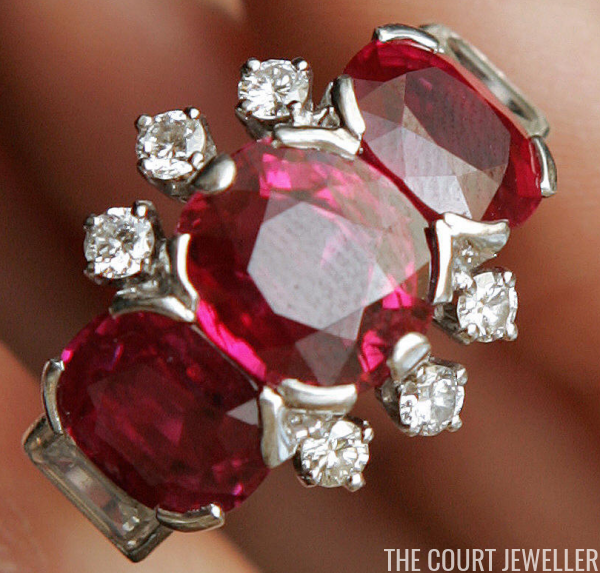 Each of the three rubies had been given to Margaret by her mother, Queen Elizabeth the Queen Mother. But the design of the ring was all Margaret herself; the notes explain that she "personally designed" the jewel. Buyers were clearly impressed by Margaret's creation: the ring sold for more than $550,000. How would you rate Margaret's eye for jewelry design?